Joy Division were an outstanding live band. I saw them support the Buzzcocks on 2nd October 1979 at Mountford Hall, Liverpool University. 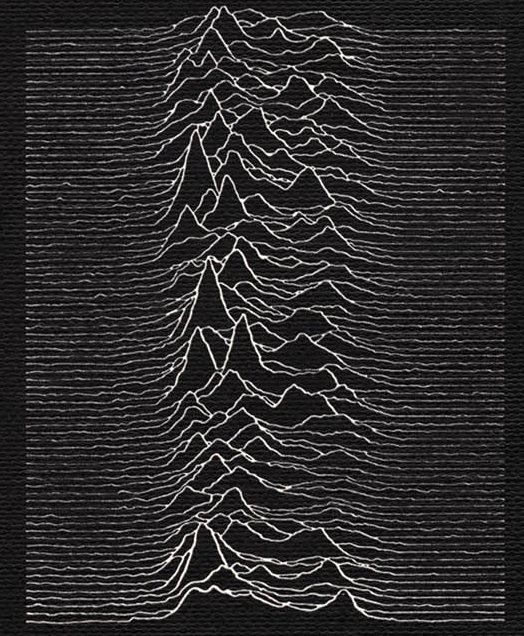 Their debut album Unknown Pleasures was released on Factory Records as FAC10 in June 1979. The front cover was a stacked time series scientific data plot in white on an expensive textured black paper. The image comes from an edition of the Cambridge Encyclopedia of Astronomy, and was originally drawn with black lines on a white background, it shows successive pulses from the first pulsar discovered, PSR B1919+21 or CP 1919.